Since we couldn't park near the main entrance to Cockermouth Forest (not plowed), we continued up North Groton Road (the paved road) to Orchard Hill Road. 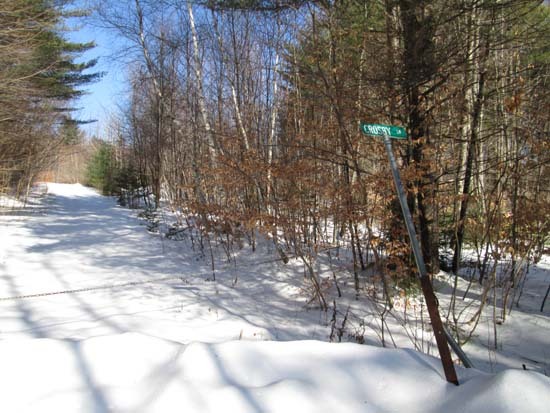 From the chain, we headed up to a mobile home, then dropped down a woods road (shows as 4WD on the USGS) to Romley-Remick Road, reaching it at its junction with North Groton Road (the woods road hiking trail). We then followed Romley-Remick up to where the trails to Little Pond break off to the left, bearing right to stay on the logging road. 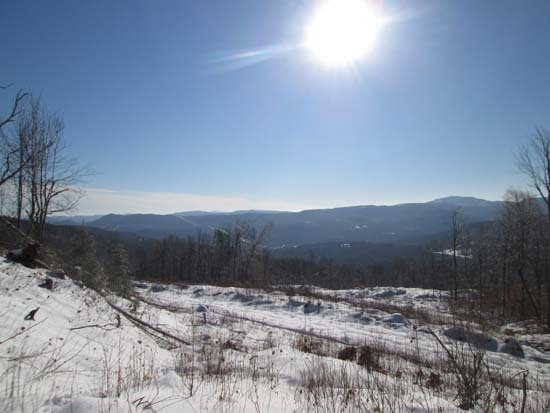 The half foot of crusy snowpack was ideal, as it was enough to cover up the logging slash. 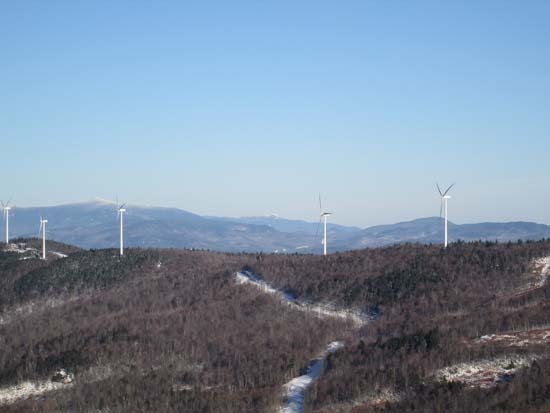 We eventually popped out at the clearcut, which is bisected horizontally by a logging road that leads to the windfarm. We crossed over it and continued to the highest point of the clearcut (good views of Kearsarge/Cardigan and no views of the turbines), then bushwhacked through fairly open woods to the highpoint of Fletcher (no sign/register, but an old piece of string on a tree). There was an unexpected nice directional viewpoint a few feet from the highpoint, which provided a look through the eyesore windfarm at the Whites (including Mt. Washington). We then doubled back down to the bisecting logging road, following it up to the col of Fletcher and the peaks north of Crosby (Nash Peak and Stills Hill?). From the col, we bushwhacked around the west side of those subpeaks in hardwoods (some prickers from the logging awhile ago), then up the north side of Crosby (steep and sprucy, but not thick). 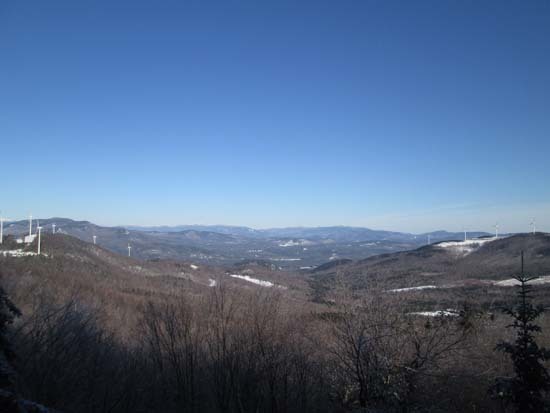 As noted in other reports, the unique White Mountain views from this state park summit have been dramatically impacted by Groton Wind, and today it sounded like you were hiking near Logan airport. From there, we followed the trail over to Bald Knob, where we encountered our first snowshoe trails of the day. Below Bald Knob at the junction with the trail coming up from Spectacle Pond, we headed back down to the west side (whereas the tracks were going to Spectacle Pond). In general, we encountered 6" of crunchy snowpack with a breakable crust on top. Barebooting would have been slow and tedious. 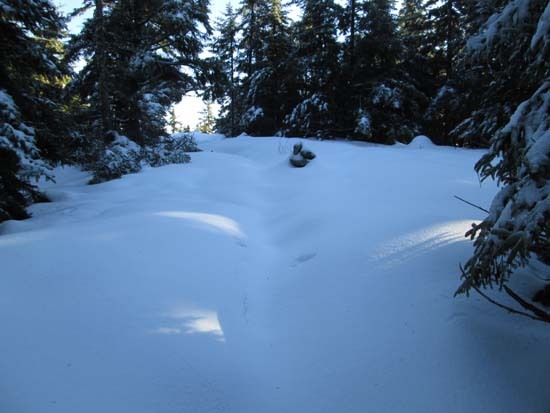 Conditions were ideal for snowshoe bushwhacking, as we were only sinking a couple of inches. Directions to trailhead: In summer, take Route 3A south from Plymouth. 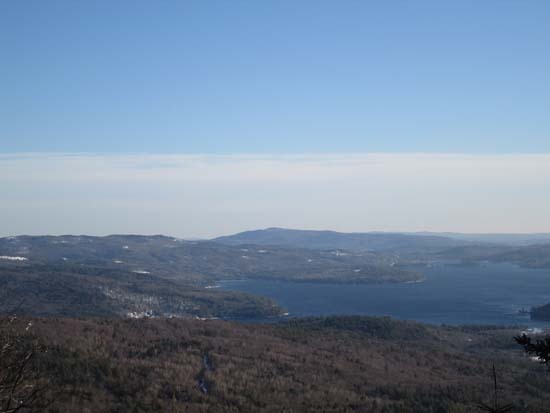 Just prior to reaching Newfound Lake, taken a right onto North Shore Road. Continue straight through Hebron onto Groton Road. Once in Groton, bear right onto North Groton Road. The Cockermouth Forest - John F. Woodhouse Trail sign will eventually be on the right. Follow that dirt road to the gate - there is minimal room for parking adjacent to the gate. 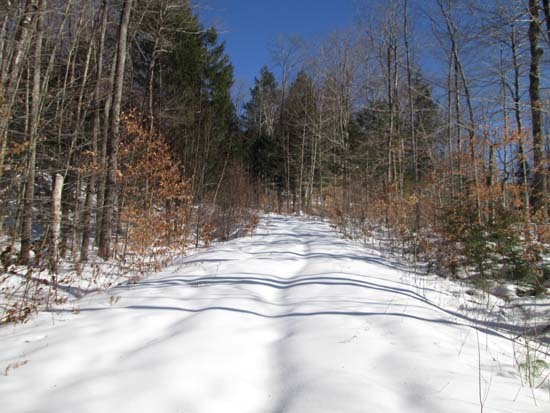 The John F. Woodhouse Trail is the logging road behind the gate. In winter, this is not plowed. One may attempt to bushwhack in via Orchard Hill Road.